This is the most important and common step for a troubleshooting PC to restart in a safe mode. You need to secure your personal files and documents but in case your PC doesn’t starts, you are unable to access the command prompt or your PC may be affected from some malware and adware, then in that case you should go with the following trick to access PC in safe mode and restore to a previous date or copy file and Reboot it. Here is a step-by-step tutorial on how to enable safe mode in Windows 8. Yupp…you read it right. We can enable safe mode in Windows 8 to access it safely, so that in any circumstances, we can use safe mode to copy files securely to any removal media or delete any application or uninstall any program, which is creating problem on your PC. Also, check out our post on tutorial to disable application switching in Windows 8. Launch “Run” box to proceed with further procedure. 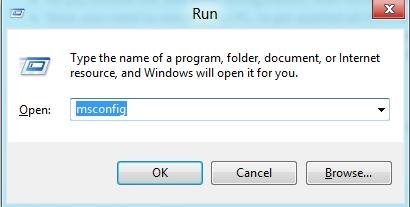 Press “Window Key+R” to launch Run box and type “msconfig” in the run box and click on “Enter”. 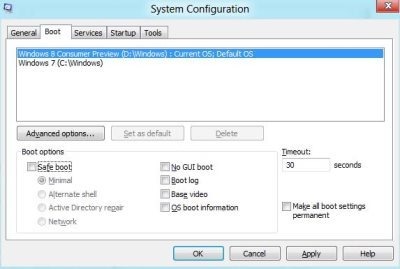 You will see system configuration box, now switch to the “Boot” tab and select Windows 8 operating system. Click and check on the “Safe boot” box. Minimal – It’s the normal safe mode. Network – Works on networking. As you choose the safe boot configuration, hit ok to proceed further. Now, you need to restart your PC, to get applied all the changes. And keep in mind before restarting, save any open files and close all programs. After restarting, your PC would be booted only in safe mode. To stop booting in safe mode, just repeat the following procedure and uncheck the “Safe boot” box. Restart it again to get changes affected on your PC. That’s all…you are done with it. This is an excellent procedure to secure important files on PC. You can even stop and uninstall any unwanted program affecting your PC by connecting it to safe mode.